I had been doing some errands and noticed it was time for lunch. To save some money and not eat out, I thought about what we had in the refrigerator. There was some left over Garlic Lemon Rotisserie Chicken, and some fresh produce I bought a few days back. I had an idea for a lees than 20 minute from chopping and cutting to sauteing and plating. A part from saving some money, and not buying an inflammation causing , not to mention junk fast food, I made a healthy delicious fast food of my own. 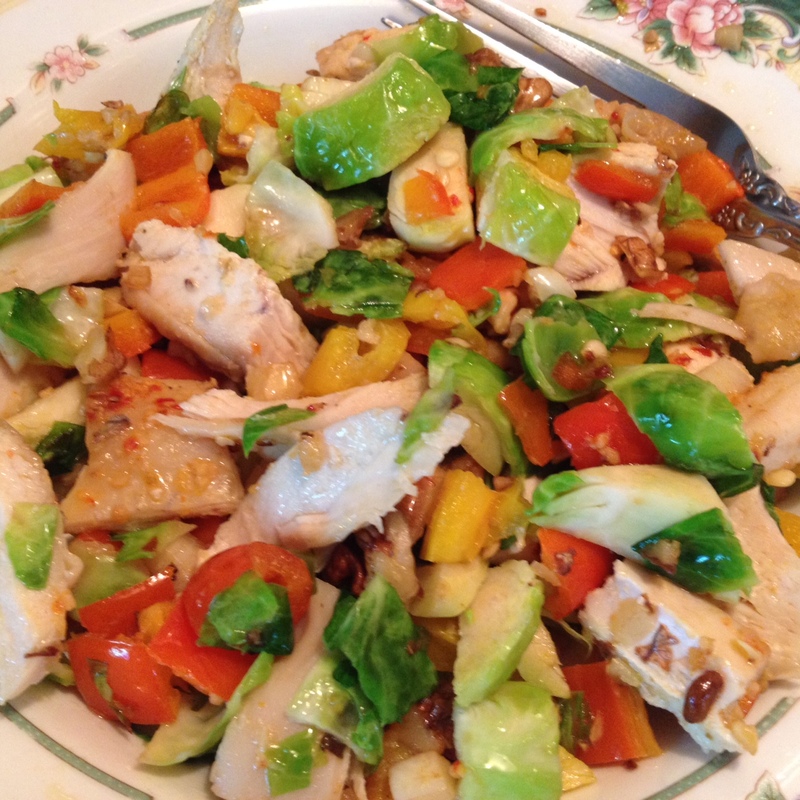 The other ingredients I used were Brussels sprouts, sweet peppers, garlic, walnuts, and avocado oil. You can’t get a good meal from any fast food place with these ingredients. Will maybe if I had been close by to the Whole Foods Market. I used red and yellow sweet peppers. The red for heart health and the yellow for joint health. Also the Brussels sprouts smash out cancer cells, as well as detox your liver because they are green, and walnuts have a healthy fat that is great for the cells in your brain, so walnuts for brain function. The avocado oil also is great for brain function and supporting all the cells in your body. Without fat your cells would age and die faster. Consider the fat around your cells, like the air bag in your car that explodes upon a car accident. The air bag protects you, just like fat protects the cells from free radicals. Preheat a large ceramic coated skillet with the 1/8 cup avocado oil. Next add garlic and saute just until brown. Next add peepers, Brussels sprouts and walnuts, stir in and continue to saute. Wen you note the peppers have turn a brighter color, add chicken and stir a few minutes just to warm the meat. Plate and add a little sea salt for flavor , if you desire. I didn’t add and salt as the garlic was sufficient for great flavor. This is my idea of fast food – What is yours? 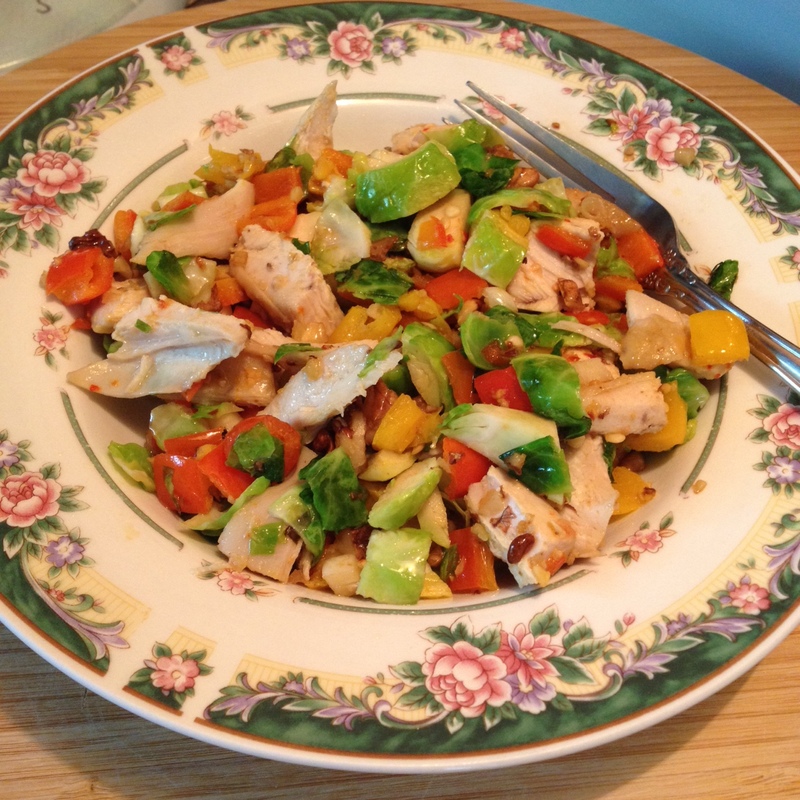 This entry was posted in Meals in 30 Minutes or Less, Salads as a Main Course and tagged Avocado oil, Brussel Sprout, Brussels, Brussels Sprouts, Fast food, Food, Garlic, Lemon Rotisserie Chicken, Sautéing, Walnut. Bookmark the permalink. Thanks Jueseppi…much appratiated for all the times you re-blog our post’s here at Splendid Recipes and More! !